It seems like the asking price for Jacoby Ellsbury is too high for the Texas Rangers and they have decided to fill their outfield needs elsewhere this off season. The Rangers are trying to fill the void left by Nelson Cruz who is now a free agent. The Rangers are now looking at Shin-Soo Choo to roam their outfield this coming year and for years to come. Both Ellsbury's and Choo's agent is Scott Boras. It is rumored that Boras is looking for both Ellsbury and Choo to sign long term deals that are worth more than $126 million and upwards of 7 years. One major reason that the Rangers may be out of the Ellsbury sweepstakes is that he plays center field while Choo has played the corners of the outfield as well. The Rangers have an up and coming center field, Leonys Martin who was a rookie in 2013. Martin played in 147 games last year and hit .260. He hit 8 home runs and drove in 49 runs. With teams now pulling out of the Ellsbury sweepstakes how long will it be until Ellsbury signs with a club? He will be generating interest from many clubs including the favorite to sign him, the Seattle Mariners. 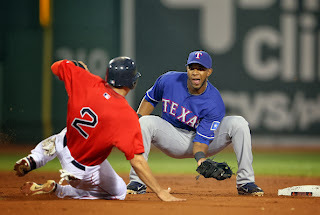 What do you think about the Rangers stopping their talks with Ellsbury? While it is unlikely that he returns to the Red Sox next year how much hope to you still hold on that he may take less money to come back to the team he won two championships with? Leave your answers in the comments below or let me know on twitter.